Honeyguides besmirch their rather charming image as guides for honey-lovers with a less charming aspect of their behavior. All honeyguide species are brood parasites. There is little or no pair bonding between sexes. Adult female hon-eyguides lay fertile eggs among those of other bird species, usually one egg per nest, occasionally two. A female will lay six eggs or more, but divide them up among host nests. All host nests are cavity types—in trees, in the ground, in termite mounds, or in carton ant nests. The honeyguide female will invade a host nest when the host female is out foraging, or perhaps sit and wait if the host female is home. Although the host female must leave to feed sooner or later, the honeyguide cannot wait too long at one egg-laying spot because the host female or a bonded male and female will sometimes chase off the intruder. (Prodotiscus zambesiae), which are blue, matching the color of the eggs of white-eyes, their most frequent hosts. The list of host species for honeyguides is long, but all are cavity-nesters and all are mainly insectivorous. Host choices of a honeyguide species may be as specific as one or two species, or a wide selection. 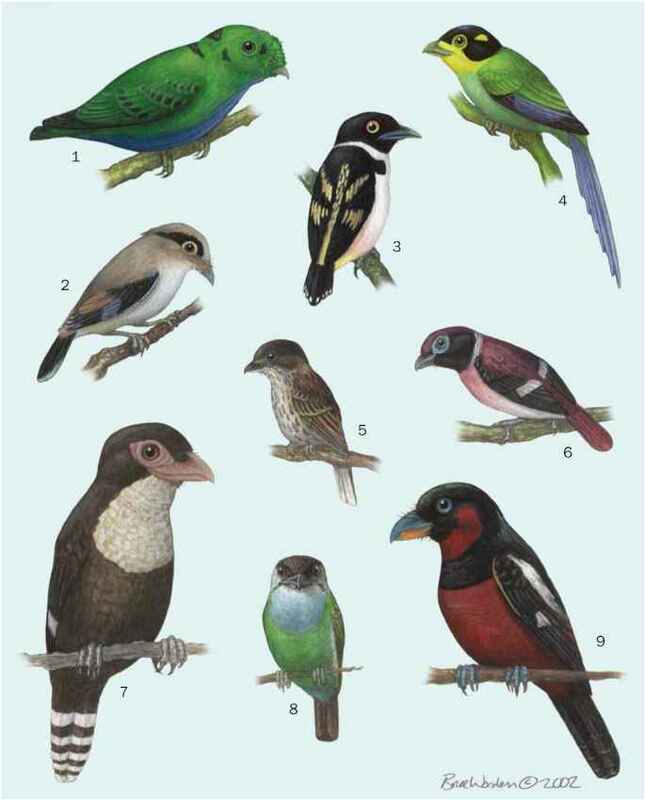 The most frequently chosen hosts are barbets, but honeycreepers choose hosts from among the kingfishers (Alcedinidae), bee-eaters (Meropidae), hoopoes (Upu-didae), woodpeckers (Picidae), and others. The parasitic honeyguide eggs may hatch when the host's eggs are still unhatched, or after their hatching. The young honeyguides hatch with hooked bills and formidably sharp talons, with which they puncture the eggs or savage the young of the host. Some honeyguide hatchlings heave the host hatchlings from the nest, or the host mother, following hygiene instincts, will toss out the dead chicks or punctured eggs. The host mothers, bound and trapped by their strong instincts for parental care, raise the intruders as their own. Honeyguides are obligate brood parasites, i.e., brood parasitism is the only option open to them for raising the next generation. No honeyguide species builds nests and none are able to raise young by themselves. Of necessity, the breeding seasons of honeyguide species closely accord with those of host species.